Happy St. Patrick’s Day! 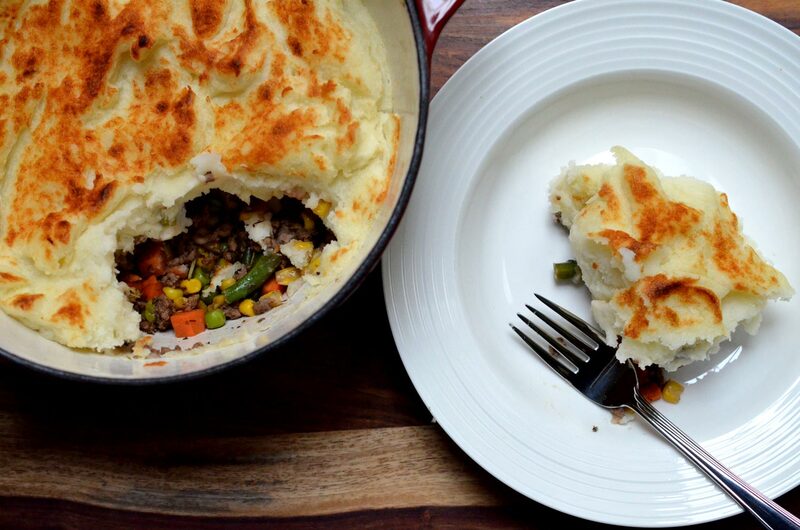 In honour of this lovely Irish tradition, I thought I would share a delicious shepherd’s pie recipe from one of my good friends. Done with traditional Irish flavours, this hearty dish is a great for a winter’s night and perfect for dishing up for frozen lunches! If you’re feeling adventurous, you can try mixing up the spices and liquid with other flavours – like Italian with basil, oregano and crushed tomatoes. *These can be substituted for mixed frozen vegetables, if desired. Place potatoes in a large saucepan over medium-high heat and cover in water. Simmer until soft and easily pierced with a fork. Meanwhile, cook the ground meat in a large skillet over medium heat. Break-up with a wooden spoon and sauté until fully cooked (you should be able to see no pink meat left). Add the onions and carrots to the cooked meat. Cook until the onions are translucent and the carrots have softened. Add the peas and corn. Mix and warm through for 2-3 mins. Add the Worcestershire, thyme, rosemary and bay leaves. Add the beer. Let simmer until the frozen veggies are thawed and the liquid has reduced by half. About 3-4 mins. Once the potatoes are fully cooked, drain. Add butter to the saucepan and mash until smooth. Add the whipped cream and mash again to incorporate. For fluffy mashed potatoes, beat with egg beaters for about 5 mins. Remove the bay leaves from the meat mixture and evenly distribute over the bottom of a large baking dish. Layer the mashed potatoes across the meat mixture. Using a pastry brush, brush the top of the mashed potatoes with the melted butter.